Skills and abilities: Drumm possesses a PhD in Psychology giving him great knowledge of conventional medicine and psychology. He is a proficient street fighter. Drumm also possess great escapist skill allowing him to escape from traps and infiltrate places unseen. Powers: Drumm is very proficient and well-trained in the art of voodoo. His power allows him to speak with the Loa who grant him various favors and powers. By tapping the power of the Loa he can create smoke and control fire to which is also immune. Drumm can also command and take control of animals. To a lesser degree he can also control humans. He can also use his powers to resurrect the dead and use personal objects of people to inflict harm. He can summon the spirit of his brother Daniel to enhance his physical attributes to superhuman levels and strengthen his magic. As Houngan supreme (The most powerful Voodoo sorcerer) he was granted the Staff of Legba. As Sorcerer Supreme (The Most Powerful Overall sorcerer) he was granted the Eye of Agamotto, the Orb of Agamotto and the Cape of Levitation. Jericho was born with twin brother Daniel, as a child growing up in Haiti, a culture which embraced Voodoo, Magic and superstition the academically adept Jericho was out-of-place. He was very skeptical about magic actually existing. One day on the way home from school himself and Daniel tried to help an old homeless man who was being bullied by two of their more wayward friends. The old man mistook Jericho’s actions and cursed him that all he loved or showed affection would suffer [Doctor Voodoo Avenger of the Supernatural #2]. Terrified the boys ran all the way home just in time to witness their parents bodies being taken out of their house. Jericho fled thinking he had been responsible only to get confirmation in the form of the bloodied old homeless man with weapon in hand who told him to run and save his brother and aunt Matilda the same fate [Doctor Voodoo Avenger of the Supernatural #2]. He blamed himself for his parents deaths and soon left Haiti for America on a scholarship to study Psychology. For ten years he stayed in America before finally returning to Haiti when his brother lay sick and dying. By this time he was an accomplished author scholar and noted psychologist [Strange Tales #169, 1973]. Modern medicine could not save him however as his ailment was magical in nature thanks to a curse placed on him by Damballah, the serpent-god [Strange Tales #169]. When his brother finally died he felt guilty and angry. He attacked Damballah but was no match for his foe. Heeding his brothers final words he sought out Papa Jambo [Strange Tales #169]. Embracing the life his brother had, a life in which magic took center stage he was trained by Papa Jambo and soon realized he had a natural affinity for magic [Strange Tales #170, 1973]. Jambo was the last in a long line of Houngan supreme and Drumm his most prodigious student yet was to be his successor. Before his succession Jambo warned Jericho that to defeat Damballah he would have to perform a dangerous spell, one which may cost him his soul. In his bid for vengeance Jericho was willing to do anything and thus performed the spell with his brothers bones [Strange Tales #170]. The dance pulled his brother‘s soul from the afterlife and bound it inside his body. He was now a man with two souls and his brother’s forehead scar and white streak of hair manifested on him [Strange Tales #170]. With his task done Papa Jambo collapsed in Jericho’s arms and died having finally found a worthy successor. 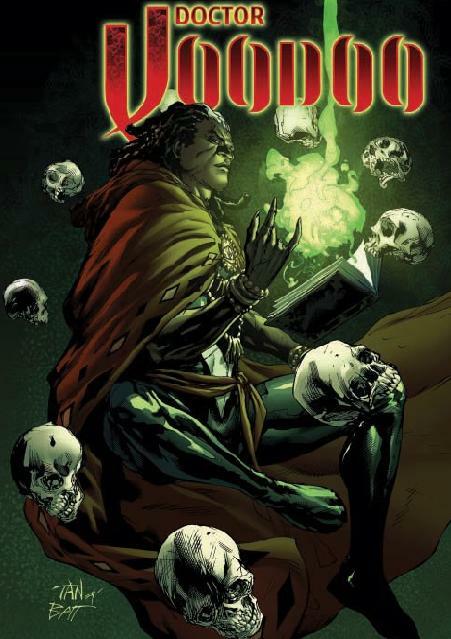 As brother voodoo he challenges Damballah and defeats him resulting in the villain’s death. He then retrieves Damballah’s amulet and Bambu swears his life to him [Strange Tales #170]. Jericho then set himself up on the outskirts of the exotic french quarter of New Orleans with his manservant Bambu [Strange Tales #171]. He battled Baron Samedi and his allies AIM when they tried to create a mindless army to take over the world [Strange Tales #171]. Brother Voodoo then defeated Black Talon and his cult. In the battle Talon’s mother was killed when she tried to sacrifice a young woman to gain youth and sight [Strange Tales #172, 173 Tales of the Zombie #6]. Dramabu later dies in battle with Jericho [Tales of the Zombie #10]. Over the years he went on to aid Spider-man [Marvel Team Up #24], MoonKnight [MoonKnight #21] and Jack Russel [Werewolf by Night 40-41]. He loses his mansion and Bambu is left in a hospital when he is forced to wear the Wangal he took from Dambalah years before which causes him to become possessed by the evil spirit that dwells within it. With the aid of Dr. Strange he is freed [Dr Strange #48]. Jericho briefly serves with Nick Fury’s Howling commandos as a supernatural consultant [Nick Fury and the Howling Commandos #2-6]. An adventure in New Orleans found him working with fellow black superheroes Blade, Black Panther, Photon and Luke Cage to defend the city from a vampire attack [Black Panther v3. #12-13]. After this he started an on-again-off-again relationship with Photon [Marvel Divas 1-4]. After the superhuman ‘Civil War’ he registers his powers and becomes SHIELD’s main magic user when Dr. Strange joins the New Avengers and refuses registration [New Avengers #29-30]. He was then captured by the Skrull and impersonated. When his doppelganger was killed this revelation allowed the Black Panther to prepare Wakanda for the ‘Secret Invasion’ [Black Panther #38]. After Secret Invasion Jericho returned to earth [The Hulk #9]. When Strange was deemed unfit for the mantle of sorcerer Supreme the eye of Agomotto appeared to Jericho. At first he doubted whether or not he should accept the mantle of sorcerer supreme but thankfully his brother Daniel managed to convince him to accept his destiny [New Avengers #54]. With the mantle of Sorcerer Supreme he attacked the Red Hood who had formed an alliance with Dormamu and was running amok in the streets trying to kill Dr. Strange and the Avengers lead by his friend Luke Cage [New Avengers #53]. Alongside Strange and Son of Satan he freed Red Hood of the possession and cast Dormamu back into his dimension [New Avengers #54]. To establish himself as the true mystical protector of the earth he went on a search for knowledge even reading a mutated variation of the forbidden Darkhold which had been transcribed by elder monks in Lewoc [Doctor Voodoo Avenger of the Supernatural #1]. Jericho then went about sealing demons even using dark Magic. After conferring with Dr. Strange he managed to seal Darmamu in his own dimension by using his immunity to fire and the staff of Legba. Strange disapprove of his methods but Drumm suggested that Stranger’s methods had failed and that’s why he was trying different avenues. [Doctor Voodoo Avenger of the Supernatural #1]. He next had to battle Dr. Doom who thought himself worthy of the mantle of sorcerer supreme. Though he was defeated when Doom gazed into the eye of Agamotto he left it with Drumm realizing the mantle was a curse and not a blessing [Doctor Voodoo Avenger of the Supernatural #1]. Drumm then had to fend off the hordes of Nightmare and battle the enslaved superheroes in order to save earth. He also unsealed the gate of ‘Bondye’ to imprison nightmare which left earth susceptible to the god Ogoun the slayer [Doctor Voodoo Avenger of the Supernatural #2-5]. While meditating one day he is attacked by Dr. Strange and Son of Satan attack him. His brother immediately realized Jericho could not win the fight and told his brother to run. When Jericho didn’t the villain captured his brother. He lost the eye of Agamotto and tracked it to the New Avengers. When a possessed Iron Fist now possessed teleported away with the eye the dimensions began to bleed into each other causing Armageddon [New Avengers v2. #1]. Jericho tried everything to get his brother back but found nothing [New Avengers v2. #2-4]. When Iron Fist returned with the eye, Jericho took it from him since it was his responsibility as the sorcerer supreme and his brother had contacted him revealing his location and his captor. Apparently the forces of the light dimension and Agamotto himself had come to reclaim it [Avengers v2. #5]. By reclaiming the eye Jericho had ushered a challenge to the death to Agamotto and against his wishes ends up using Wolverine as a vessel for the combined powers of the New Avengers, Dr. Strange Son of Satan and himself [Avengers v2. #5]. During the battle his brother was placed in danger and reliving the guilt of his youth he entered the fray to end the threat with finality. He used all his might to destroy Agamotto and as a side effect was also killed thus saving the world [New Avengers v2. #6]. During the events of AXIS he is seemingly brought back to life and allied with Dr. Doom as they battle the inverted Scarlet Witch. After AXIS he joins the All New Captain America,Scarlet Witch, Quicksilver etc in the new Uncanny Avengers team. Doctor Voodoo, The Houngan Supreme! I am sincerely hoping they bring back Dr. Voodoo, even if he’s not the Sorcerer Supreme. As for who was right, they’ve both changed their outfits in the present day.